HA NOI (VNS) — Shares nationwide lost ground yesterday, but profit-taking drove up the market's trading value to a five-year high. On the HCM City Stock Exchange, the VN-Index shed 2 per cent to close at 626.92 points. The value of transactions hit a five-year high of VND5 trillion (US$235.8 million) while trading volume also climbed to 280.3 million shares. Almost all of the 30 blue chips on the VN30 Index lost value, with financial shares Tan Tao (ITA) and Ocean Group (OGC) reaching the floor prices. Several declined strongly, including rubber company Casumina (CSM), Phu My Fertiliser (DPM), software developer FPT (FPT) and Kinh Do Confectionery (KDC), as well as steelmaker Hoa Phat (HPG) and Refrigeration Electric Engineering (REE). Only logistics company Gemadept (GMD) and PetroVietnam Drilling Services (PVD) managed to rise. The index closed 2.1 per cent lower to 664.65 points. 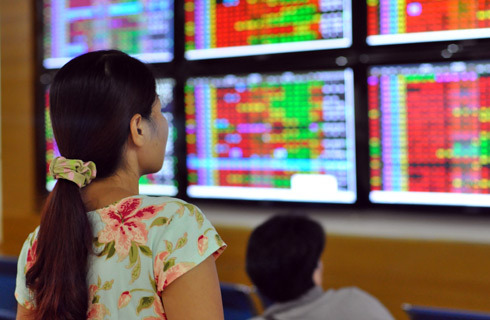 On the Ha Noi Stock Exchange, the HNX-Index also plunged by nearly 3.7 per cent to 86.40 points on a turnover of VND1.6 trillion ($75.4 million). The HNX30 Index, tracking the exchanges 30 largest shares by capitalisation and liquidity, declined by 4.67 per cent, reaching 176.71 points. While domestic investors rushed to sell, foreign investors took the opportunity to buy. In HCM City, they bought a net of more than VND118 billion ($5.5 million), a whopping 220.5-per cent increase compared with that of Monday's session. Meanwhile, they were net sellers in Ha Noi by VND8.6 billion ($405,600). With such a hefty fall like yesterday's, FPT Securities Company analysts predicted that the market would continue to decline. However, they said the medium- and long-term prospects remained positive.